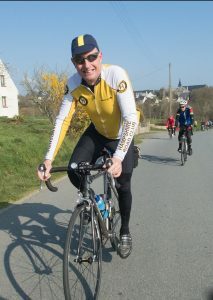 Paul Whitehead - a past President of Portsmouth CTC - passed the 300,000 mile mark on Sunday, 31st March, while on tour in France. He is now eligible to join the exclusive 300,000 Mile Club; something that only a handful of Portsmouth CTC members have achieved. To put his achievement into context, that's over 12 times around the world - at the equator! Or a lot further than the distance to the moon!